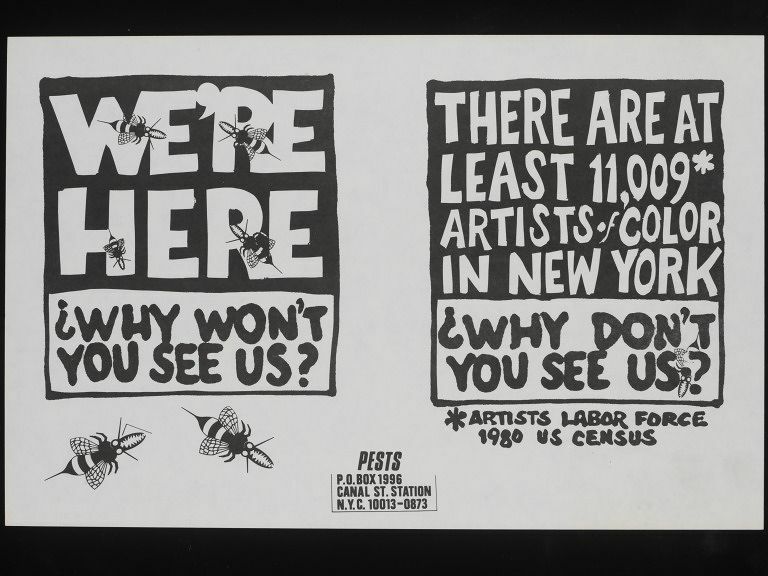 PESTS were anonymous protest/pressure group of artists operating in New York in the 1980s. Like the better-known Guerrilla Girls who protested against discrimination, exclusion and tokenism directed towards women artists by commercial galleries and major museums and art institutions, PESTS aimed to expose the similar problems facing ‘artists of color’. 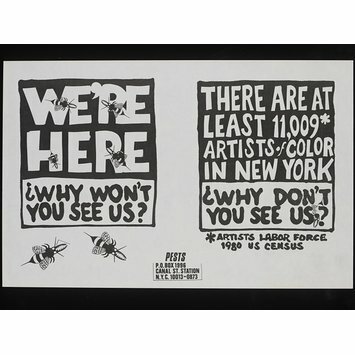 Taking as their logo a wasp-like insect with serrated pincers and a sting in its tail, they produced a whole range of ephemera promoting their cause, from brochures listing the New York galleries which represented no black artists, flyers protesting against tokenism by art institutions, and stickers showing just the logo. This rare material has been donated by a former member of PESTS, who wishes to remain anonymous in relation to this gift. None of the other former members have identified themselves, and the history of their activities remains obscure. According to records in the Smithsonian’s oral history archive, PESTS was established by a black female member of the Guerrilla Girls, around 1986. Flyer with two protest messages printed in black and white, with name and address of PESTS and their 'insect' logo.